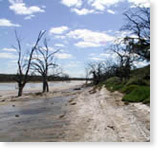 The Department of Water, Land and Biodiversity Conservation coordinates the management of the Murray River in South Australia. It does this in close partnership with the South Australian Murray-Darling Basin Natural Resources Management Board and the Murray-Darling Basin Authority. A healthy working Murray River is essential to the future viability of South Australia. Protecting, enhancing and restoring the health of the Murray River is one of the State's highest priorities and is reflected in South Australia's Strategic Plan. This precious water resource is used for many purposes including environmental, irrigation, urban, stock and domestic use. The Murray River is a vital water supply for many parts of South Australia and it is essential that all Governments manage the River for economic, environmental and social benefits. Water resource conditions in the Murray River within South Australia are monitored on a daily basis. Data on flows, water levels, and water quality is collected on a daily basis at a number of monitoring points throughout the system within South Australia. The regulatory framework for water resource management in South Australia, including water trading, is established through the Natural Resources Management Act 2004 (SA). The Trade Approval Authority responsible for administering the water licensing provisions of the Natural Resources Management Act 2004, including processing water trades is the Department for Water (DFW). To apply for a trade, an application form must be lodged with DFW. The application form has two key parts, one to be completed by the transferor (seller), and the other by the transferee (buyer).